It goes without saying that Claude Giroux is the leader of this Philadelphia Flyers team, despite the fact that the team has been captain-less for a few months. The 23-year-old center enjoyed his best regular season in the National Hockey League, finishing 3rd in the league with 93 points. He set a career-high with 65 assists, which was good enough for second in the league, and has catapulted his way into the discussion of being one of the best players in the world today. He has thrived in a situation where there is a tremendous amount of pressure on him. Now all he needs to do is win the Stanley Cup. And that’s just what Giroux needs to do in order for this Flyers team to make a deep playoff run. Scott Hartnell and other players have acknowledged the importance of goaltender Ilya Bryzgalov and how his play is perhaps the biggest factor in this year’s playoffs. 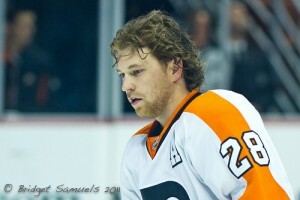 However, they also see Giroux as the team’s on-ice leader. Giroux will lead the Flyers in their first round series against Evgeni Malkin, Sidney Crosby, and the rest of the Pittsburgh Penguins. He seems ready for the challenge, despite many picking his team to drop the series to the playoff seasoned Pens. Giroux has been individually successful against the Penguins this year as well, scoring a goal and racking up 7 assists in 5 games against the Flyers’ Pennsylvania rival this season. The Ontario native has had success in the playoffs as well. In 40 career playoff games, Giroux has racked up 13 goals and 25 assists (38 points). CSNPhilly.com’s Tim Panaccio wrote an article comparing Giroux to former Flyers’ captain Mike Richards and how they both like to lead by example. The Flyers hope that Giroux can carry them one step further than Richards did a few seasons ago.